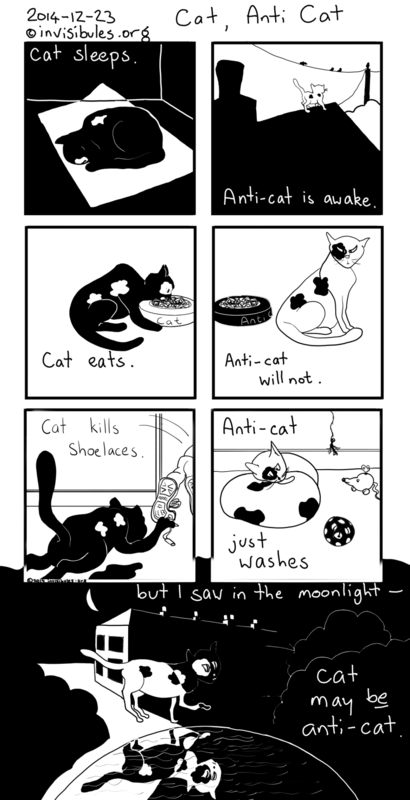 A comic inspired by the neighbours’ cats we see in our garden. Cat sleeps. Anti-cat is awake. Cat eats. Anti-cat will not. Cat kills shoelaces. Anti-cat just washes. I like this one. Your drawings are much improved as your skill increases, though in some ways I miss the earliest comics. We have a cat, anti-cat, and marmalade cat. They do not interact as well as your neighbors … hissing & chases are frequent.